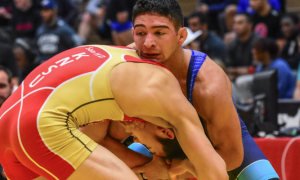 The busy summer of 2018 for the US Senior Greco-Roman World Team continues this week as the squad makes its way over the pond to Dortmund for the Grand Prix of Germany. Set to take place this coming weekend, the German Grand Prix is intended to provide a competitive litmus test for the athletes, and it also serves as the kickoff for what will be (let’s say it together now) an international training camp. As of right now, the status of 67 kilogram rep Ellis Coleman (Army/WCAP) for Germany is undecided. Coleman tweaked his knee in Vegas, and while initially there were fears he might have suffered a serious injury (i.e., a torn ligament), it appears that is not the case. Reached earlier today, Coleman indicated that he will be undergoing an MRI later in the week and that perhaps Germany isn’t out of the question, so long as it isn’t too late and the prognosis is positive. We will update here and elsewhere when that information becomes available. Several National Team members who aren’t ticketed for Budapest are also making the trip. 2018 World Team Trials runner-ups Max Nowry (55 kg, Army/WCAP) and Alex Sancho (67 kg, NYAC) are going, as is Lucas Sheridan (97 kg, Army/WCAP). In addition, Junior World Team member Taylor LaMont (60 kg, Sunkist) is jumping on board in lieu of attending that age group’s camp at the Olympic Training Center, and 2014 World Teamer Joe Rau (87 kg, Chicago RTC) is joining the American delegation for the GP, which will be his first Greco competition since the US Open this past April. *Note: the Grand Prix of Germany offers a 2 kg allowance. 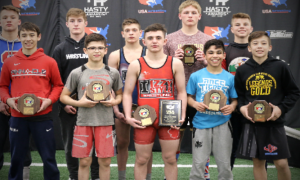 The 2018 Junior Greco-Roman World Team broke out of the South Point Hotel in Vegas just a little earlier than everyone else and promptly began their own camp at the Olympic Training Center in Colorado Springs on Friday. 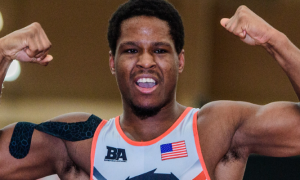 They will be two guys light over the course of the camp, as the aforementioned LaMont and reigning World Champion Kamal Bey (77 kg, Sunkist) will both be with the Seniors in Germany. As was the case last week, we will provide perspectives from coaches during the camp, as well as a couple of the athletes. You can look forward to our coverage of the Junior Team beginning Thursday. Two-time US National Team member Hayden Zillmer (97 kg, Minnesota Storm) has been talked about a lot over the past few months, but he himself hasn’t done a lot of talking. 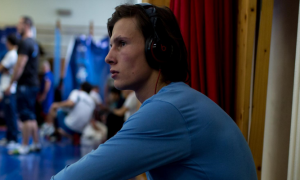 When the 26-year-old opted to compete in the Final X Series over the Greco World Team Trials, the perception surrounding his involvement in this sport skewed to where observers worried he chose leg-grabbing over the classical style. That is definitively not what is going on. 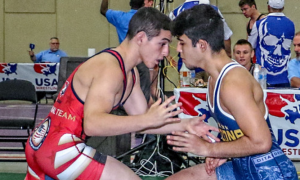 Zillmer encountered circumstances that were beyond his control after fully intending on pursuing a spot on the Greco squad in Tulsa. It didn’t work out how he had planned but he has since moved on. Below, Zillmer talks about the frustration he experienced having to forgo Greco Trials along with why he is adamant on competing in two disciplines at this stage of his career. 5PM: Can you describe the frustration you felt not being able to compete in both Trials events as was originally planned? Zillmer: You know, now, like right now, you can’t do anything about it, so it’s just something I can’t stress about. But yeah, when I was going through that it was frustrating. They came to Minnesota and said that things weren’t going to get overlapped, so I was kind of frustrated by that a little bit. At the start of the season, nothing was going to overlap and things were going to be alright. It was just frustrating. It was planned out at the beginning of the season, that freestyle and Greco (World Team Trials) weren’t going to overlap. I could see some stuff overlapping, like the Open, but I don’t know. I think at some point they will probably put the Trials together again. Maybe? I’m not sure if that’s in the plans. I hope not, I hope that doesn’t happen. But it’s just frustrating. It was in the plans in the beginning of the season, especially when I was wrestling both styles, Oh hey, everything is going to be fine. It wasn’t, but I guess that’s behind us now. 5PM: What would you say to people who question the idea that you can compete at an equally high level in both styles? Zillmer: I really, truly think that wrestling is wrestling and that you can be good at both — and if you are good at both, it’s going to make you a better wrestler. If you train both, it’s going to make you a better wrestler and no one can take that away from you. Freestyle has things I need to get better at and so does Greco. You know how some people train? Maybe they can’t train hard, maybe they can’t train hard and compete well? Some people need to train easier so they can compete better. Everybody has a different training approach and a different schedule. Me personally, I think it is kind of a mindset thing. If you buy into that one little thing where people say that one way is better than the other, then, well, I guess you’ve got to avoid those people (laughs). 5PM: Is it your goal in life to make the Olympic Team in both styles? Zillmer: Yeah, for sure, that would be a goal of mine. That would be awesome, to represent the United States in both styles. That’d be great. I feel like I have the ability to do it, I just need to execute. I think sometimes, a lot of wrestling at the level we’re wrestling at comes down to who is having the best day, and it comes down to preparation. With me, I was a small guy. I was little my whole life and I feel like I am just starting to settle in somewhere I fit, and I definitely feel like both styles can benefit me, you know? 5PM: When it comes to competing, how will you decide what you’re going to do, which style? Zillmer: Probably mostly according to how my body feels. If I’m feeling good — which a lot of times I do feel great, I’m not injured or anything — I am going to wrestle both styles. And if possibly something works out, I’ll just wrestle in a Greco tournament, or maybe possibly it will just be a freestyle tournament. It depends on how I feel, how my body feels, how my coaches feel, how I am training, and how I’m competing. 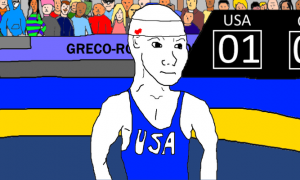 I’m competing to win, so if I don’t feel good… Let’s say your knee is bothering you in positions you find in freestyle, then I might just do a Greco tournament. Something like that. But right now? I’m ready to go. 5PM: Minnesota Storm is known for having a lot of talented upper-weights, and in both styles. What does training look like for you right now? Do you switch up practices by time of day, or by specific day? Zillmer: It’s freestyle practice normally in the morning and Greco practice is in the afternoon. Coming up here I am going to a freestyle training camp next week. That’s in San Diego. I’m on their National Team, so you’ve got to be there (laughs). My typical day is freestyle in the morning, Greco in the afternoon. Maybe some days I just go Greco, and on some days I just wrestle freestyle with a lift in the afternoon and then get some recovery in. Because, last year I was doing eight practices a week. That’s like a training camp. It was not feeling the best, doing eight practices a week and then trying to get your lift in. Definitely, it is a management thing. You have to manage that stuff. Or possibly, I train a little Greco, wrestle a Greco match, train some freestyle, and spar some freestyle at the end. Something like that. That’s how it has to be. It’s all about communication, talking with my coaches, and developing a good plan. Everyone develops a schedule with one thing in mind, and that’s to win. The 2018 Junior Pan Am Championships begin this Friday in Fortaleza, Brazil. There is more than enough firepower to go around, mostly because of how strong the Junior age group is for the United States at the moment. The customary batch of Trials runner-ups and placewinners adorn a lineup that is expected to produce its fair share of champs and medal winners, as well as the second US team title in a row. Wrestling starts at 9:00 am on Friday morning and can be viewed live in the US on Trackwrestling. Questions? Concerns? Feel like reaching out? Do so on Twitter, Facebook, and Instagram! 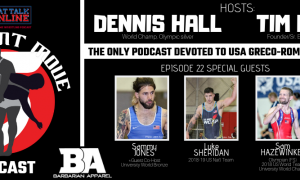 Listen to “5PM19: Past World Teamers Robby Smith and Joe Rau heading to the Chicago RTC” on Spreaker.